But, here is my start. The main thing I wanted was work space. I bought a table a few years back at a garage sale for twenty bucks. I use this for most of my crafting, but I wanted another space as well, so I found this chrome top table at an antique store a few months ago. I made this pegboard using pegboard I found at the home improvement store. I cut it down to fit inside this frame I found in the garbage on a walk. I sprayed the frame. This is where the work in progress still goes on. The frame is literally falling apart. I just need it to stay up, so I'm going to have my brother come and add some really long screws to make sure all the weight is on the pegboard. I have been collecting things from around my house and thrift stores which includes these spice racks I'm using to store washi. This is, by far, not my only washi, but....I organized these by colors. On top of the armoire is one of my favorite things-an old sewing machine I found at a thrift store for 25 dollars, a suitcase with all of my cutting boards, but most importantly-my jar of pin cushions. I've been collecting old pin cushions I find in stores.....in my mind these represent sewers and their labors from years gone by. 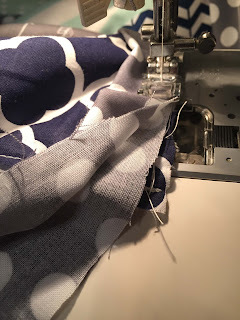 The more pinned and poked, the better. Right now, my sewing machine is on a desk from my childhood. I still need to make a sewing machine cover. I put up a pegboard (clearance at Hobby Lobby) and a corkboard (I made by cutting down cork I bought at Home Depot and put inside an old frame I sprayed). I put some of my thread in this coke case, and then framed up a few old patterns etc. There is still space above the C.....so much room to add more stuff. As for the machine, like I said, my plan is to make a cover. I have all the 'stuff'....now I just need the time. Behind the door I've hung SOME gift wrapping stuff on a storage unit I bought at Michael's. I have the rest of my wrapping paper stuff in a closet....and the hallway....and in the living room.....OK....I have a lot....too much. I guess it's time to buy a bunch of random gifts to weed out some of this wrapping paper. There is a little nook by the doorway where I put my embroidery machine and some of my cricut stuff. A gal I work with told me about these IKEA bag holders (there were something like two dollars each?) that are perfect for storing vinyl. Around the corner I hung a little TV b/c I can only stand my own company so long. I found this little pantry cart at a sidewalk sell and I filled with printers etc. The wreath is a vintage ornament wreath for Christmas, so that won't be up all year, but this little IKEA shelf will. I wanted to keep it mostly eclectic, and I would have loved to find an old hardware shelf with cubbies, but I finally gave in and bought a few storage pieces that really were just too functional not to grab, but I filled them up with funky stuff. I got this cart during a Black Friday sale at Michael's. I filled the cart with lots of funk-I got this little display rack that spins from a gal who sales Mary and Martha. I have an old type writer that reminds me of one of my first loves. I have old soda cases filled with paint, and a bread box....filled with glitter. Each cubby is dedicated to some portion of my craft world-ribbons, stamps, buttons etc. I'll open them up in a video walk through later, but....all this to say-I love all the storage. Now that everything is in place....it's time to get down to crafting business! I'm ready 2017! Here's an extra little nursery detail. 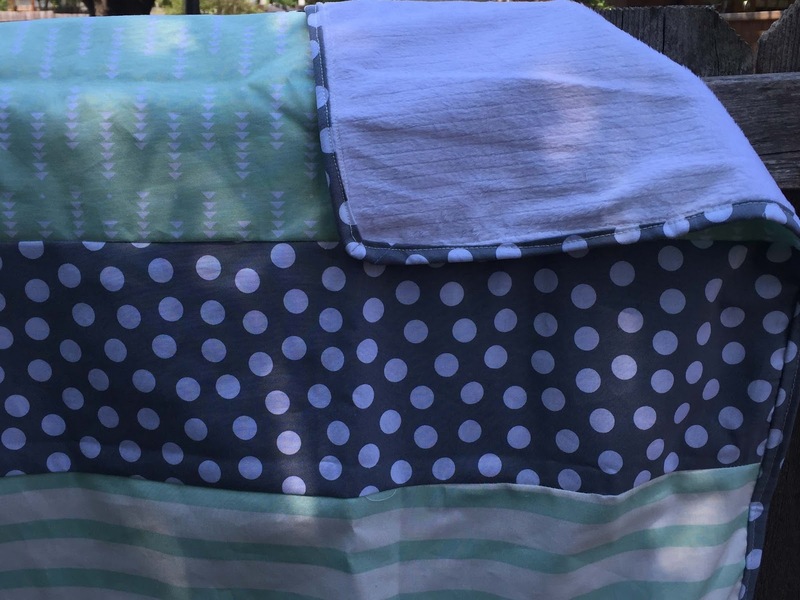 I'm posting (over the next few weeks) the details of a nursery I put together this fall as a surprise. I was giving the name for both genders so I could add some personalized details. 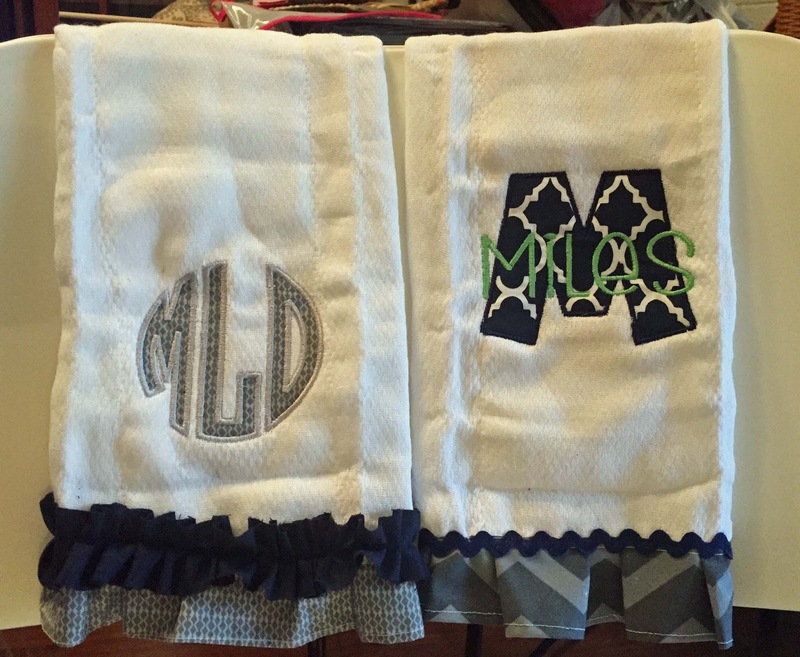 I own an embroidery machine, so I decided to make a few decorative burp cloths to match the nursery theme. I used some of the fabrics from other projects to embellish. All the details and projects are following shortly! 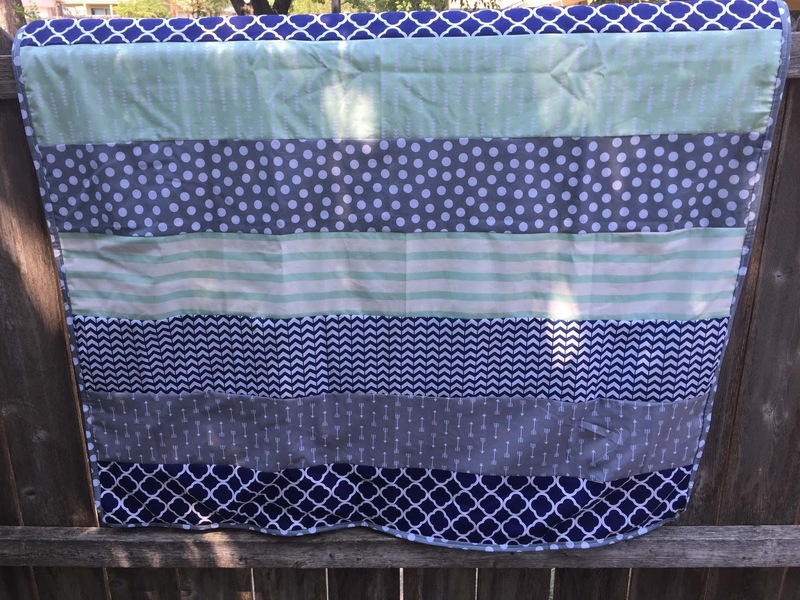 I made this quilt for a nursery I put together this last fall. I'll be posting all the details over the next month. This is the quilt I made (and later ironed, whoops). I went with a navy, mint, and gray heme, so I bought half a yard of a bunch of different fabrics/designs I liked. 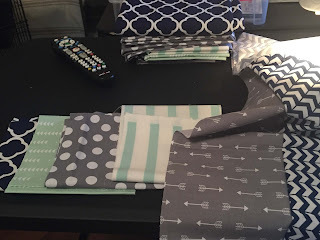 I cut the strips into 7 inch strips and sewed them together. 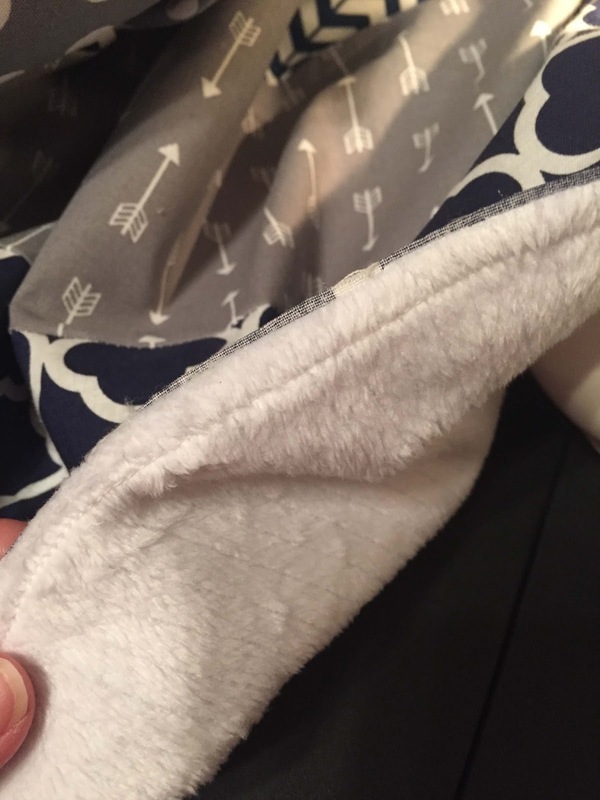 I just did enough until it matched the length of the yard of soft white fabric I bought as the back. 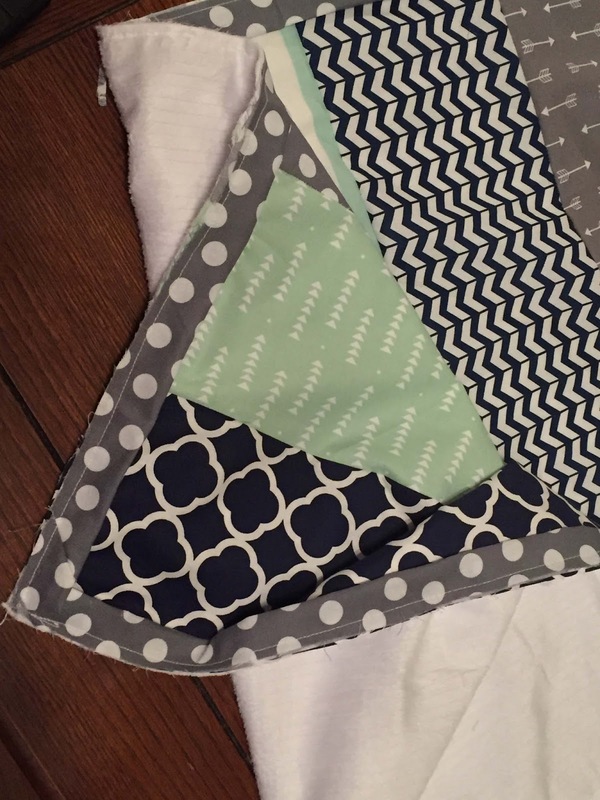 I sewed the two pieces together. 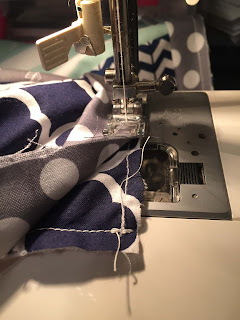 It's OK to see the seam b/c I am going to cover it with binding. I cut 4 yards of three inch pieces of one of the fabrics for the binding and then I ironed it down the middle. 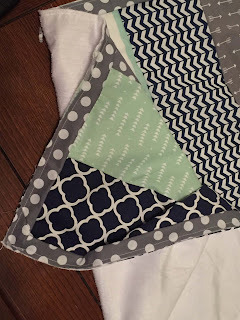 I matched the two rough edges to the rough edge on the front of the quilt. I sewed it all the way around (the fold will be facing the inside of the front at this point. Pull the folded edge to the back. 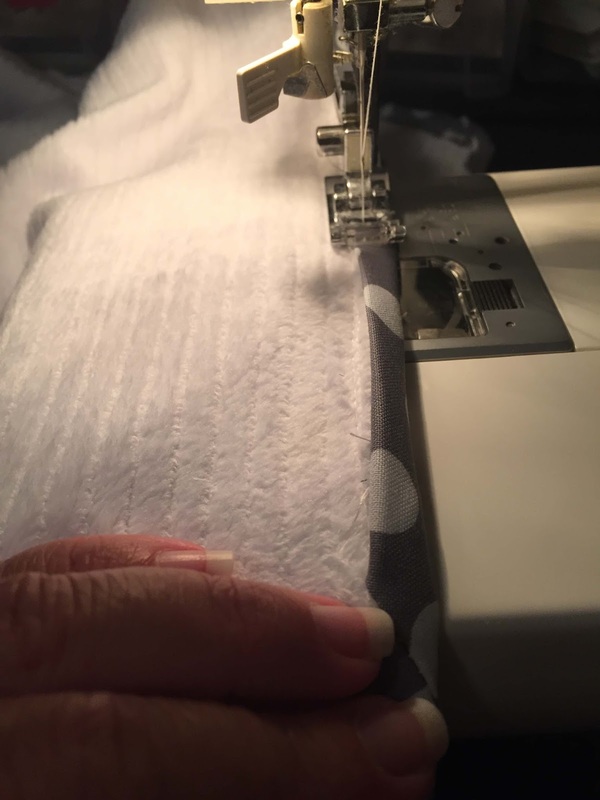 Sew it all the way around the blanket again. Here's the finished front/back. More details to come soon. I'm about to start a big posting spree on all the details of a nursery I put together this last fall. It was a surprise from WHAT the gender was to WHAT the nursery themed would be. I'll share more on that later, but the first step was picking the color scheme. 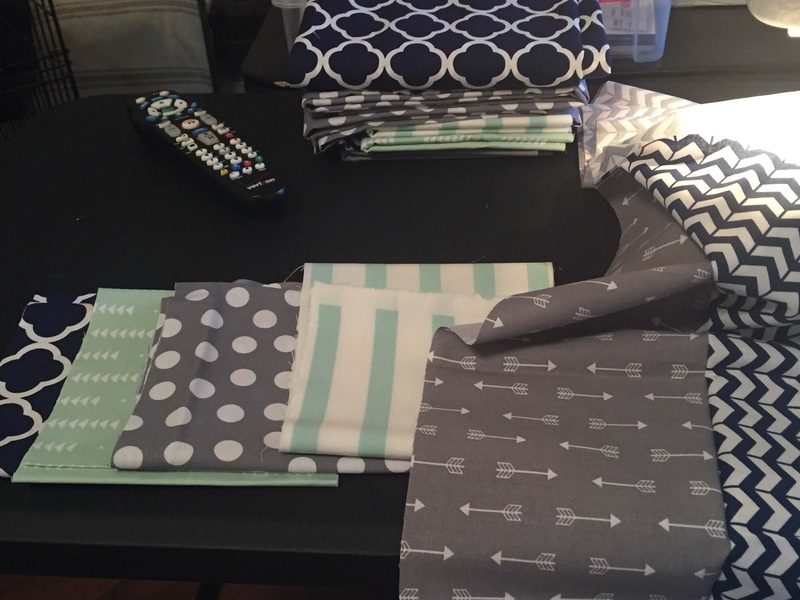 I got some ideas from the parents to be on the colors they liked for both genders, and I chose navy, gray, and mint. It was heavier on navy, but I wanted to do a few things with all three colors. 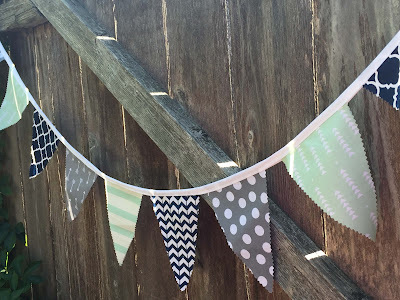 These banners are so easy to make. 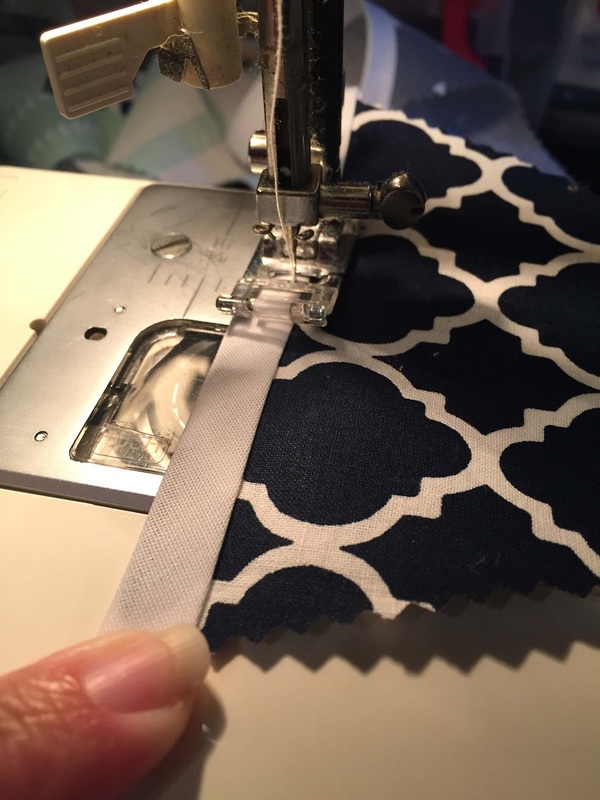 If you can sew a straight line...or even glue one this tutorials for you. 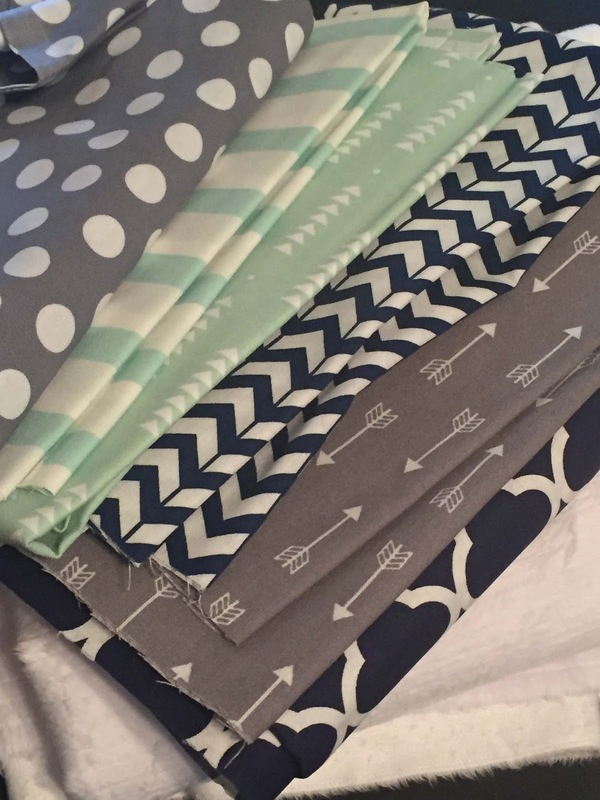 After sewing the bedding with these fabrics, I bought some binding and cut out triangle shapes out of the fabric. I used my pinking sheers so I didn't have to sew the edges (it won't fray like it would if you do a straight line). 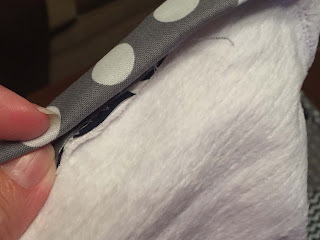 I then took the binding and sandwiched the top between it and got to sewing. I would leave about an inch between each one, but I just sewed down the whole binding. I'll share the whole she bang soon. I love vintage. I've been known to buy a thing or two at a craft store (like a needle point) simply b/c I know someone spent time making it, and I'm offended by the person who dared to sell it. Vintage ornaments have a special place in my heart. I love that once upon a time they sat on someone else tree, (hopefully) overlooking Christmas gifts, Christmas dinners, family visits, and I feel it's my duty to give them a new home! I buy them individually, or, occasionally, by the box. I found this tree topper on ebay. I've been obsessed with these indented ornaments for YEARS now. In fact, last year, I went a little nuts and bought several boxes of these Santa Land ornaments on ebay. I love that they are hand painted (in Poland?) and each so different. 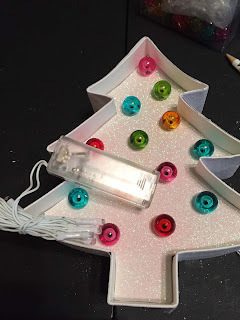 I put them on a little tinsel tree I had (from Hobby Lobby...it has a few more years until it's considered vintage). I feel like I'm running a rescue of sorts. 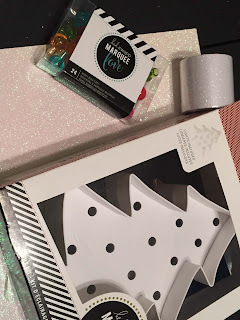 I rescue Christmas memories, and give them a few more to add to their collection of Christmas stories. At least that's my excuse for buying too many ornaments when I already have so many! I've been a little obsessed with Heidi Swapp supplies and I have a light box at work that I play with all. the. time. 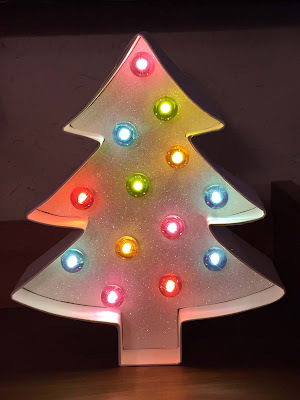 I recently saw this tree from her Marquee Letter collection (actually one from last year, so I bought mine on ebay, but they do have a different version this year). What I like is that they all come with clear lights, but you can also buy colored lights. She sells tape (including glitter tape) you can run along the sides, and it comes with a paper insert you can decorate, but I bought a sheet of scrapbook paper and used the paper as a template so I can change it out next year if I want to. Once I had the insert inside, I ran the tape around the edge (it's sticky-hence the name tape, but....still....it's nice to do a project that doesn't require glue). 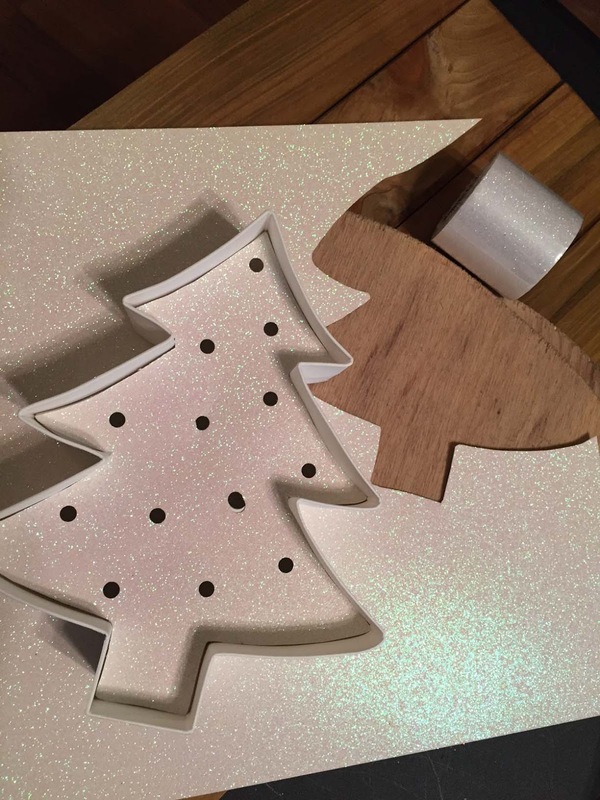 Using the paper and tape prevents the usual glitter shed, though you could use glue and glitter just as easily. Next up came the light, and then there is a little battery pack included in the kits. So....now I have a mobile tree. It's tempting to light up my car, but I think this little guy will make it's way to work with me.